Salty chips, cheese, spicy salsa, guacamole, cilantro, sour cream and maybe some refried beans or ground meat—these are mostly low-carb options and are not what makes nachos a high-carb food. The carb-loaded culprit is the tortilla chips. Once you figure out how to ditch the chip, you can return to enjoying this carb-friendly snack. Just as with pizza, the toppings are fine and low-carb; it is the base that trips up carb-watchers everywhere. Check out the following base substitutions that might work out for you and your tastes. You can make oven-baked crisp chips out of almost kind of fairly hard cheese that has the ability to melt. The only trouble with cheese chips is that they are so filling that you cannot eat many. You can substitute vegetables like eggplant, zucchini/other summer squash, and celeriac (celery root) for starchy foods, like carb-loaded corn or flour tortilla chips. There are several methods to make the chips, such as frying, baking, and using a dehydrator. Baked chips are trickier to make than frying. The chips might be less crisp than frying, but the trade-off is that will be less greasy. Use a mandolin or other slicer to cut the vegetables thin. Use oil with a high smoke point, like avocado, corn or canola oil, and make sure the oil is at least 300 F (especially since eggplant absorbs oil like a sponge). The hotter the oil, the less greasy the chips will be. Lightly oil the veggie pieces to preventing sticking to the pan. Line a baking pan with parchment or a silicone mat. Eggplant can be cut in 1/4-inch slices, baked in a 400 F oven for about 20 minutes (flip halfway through). If chips are soggy, even though browned, turn off the oven and let the chips sit and dry out. Zucchini has a higher water content, so the slices must be baked on low for longer. Set the oven to 225 F for one to two hours. Zucchini needs to partially dehydrate before starting to brown. Toss in a little oil, any kind, and salt. Dehydrate at about 135 degrees for 6 to 24 hours. To test if they are done, allow a few to cool for 30 to 60 minutes. Fully dehydrated vegetables will store for many months at room temperature. 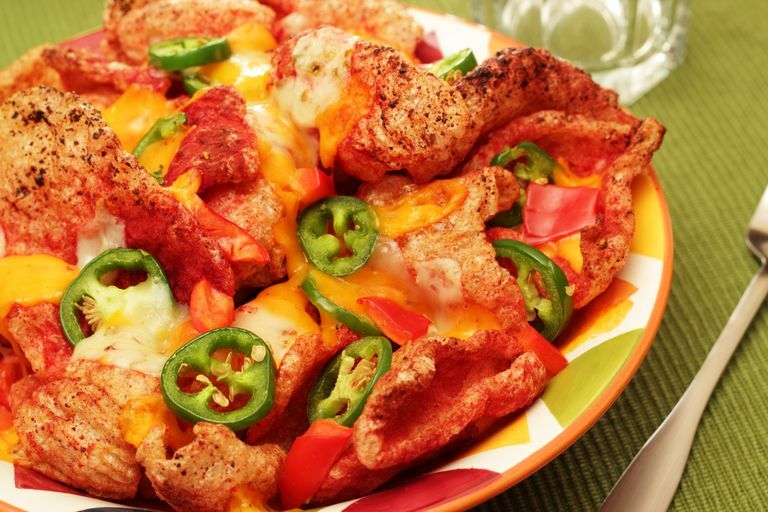 Some vegetables may not work well as chips, but can still work for nachos. For example, you can cut bell peppers into any size you like and then broil them. Broiling is much quicker than making chips. Small to medium-sized bell peppers can be cut, then baked for 10 minutes at 375 F. Sprinkle the peppers with cheese and broil until the cheese is bubbly and the peppers are slightly charred. Cabbage is another vegetable that can work well with nacho toppings. Tear pieces of cabbage, and sprinkle those pieces with cheese. Then, broil the cabbage until the cheese is bubbly, and there is a little char on the edges of the cabbage. If you like tofu, you can make fry tofu chips, melt cheese over them in the oven or microwave, and top them with your favorite nacho fixings. Another option to try as the base of your nachos is buying low-carb tortillas from the market, cutting those tortillas into chip-sized triangles and then frying them. Pork rinds may not seem a healthy choice, being that they are made from deep-fried pig skins, but in moderation, this common junk food actually has some value. This snack food has zero carbs, nine grams of fat—43 percent unsaturated—and 17 grams of protein, which make them more acceptable than a small bag of potato chips. This no-carb option is another base that many people like to put their nacho toppings on. Good accompaniments for nachos like refried beans, guacamole or bean dip do not have to break the carb bank. The following list of side recipes can help round out your meal plan. How Do You Make Crunchy Low-Carb Celeriac Chips?